Replacement filter for Aqua Vessel filtration bottles filters up to 100 gallons of water. The Aqua Vessel filter is certified to remove up to 99.9% of Giardia and Cryptosporidium, and it also reduces microscopic pathogens, heavy metals, dirts, and sediments. Use it for tap water, in streams when you're hiking or camping, or when you're traveling abroad. With the Aqua Vessel, you'll never need to buy another plastic bottle of water again. Straws not included. Upon first use, water will be difficult to draw through the filter. Once water is pulled through the filter, you may notice a black carbon residue in your water. This water is completely harmless and will only last for the first 5 or 6 sips. It can be discarded into a sink or other receptacle. 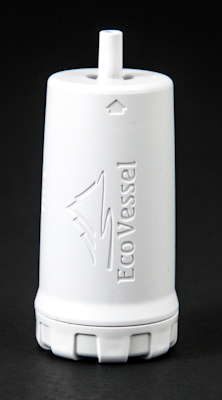 *Since the development of the Eco Vessel Filtration system, they have used different types of packaging. Please be aware that the filtration system is exactly the same in each of the different versions. The only thing that differs is the design and/or shape of the packaging.